Another classic day walk from Chamonix today. One of the finest views of the Mont Blanc range is from the beautiful Lac Blanc. Lac Blanc, along with several lower lakes which are collectively named Lac de Cheserys, lye on the opposite side of the valley looking across to Mont Blanc. The finest way to get to these stretches of water is from the town of Argentiere via 'the Ladders' or 'Echelles'. This series of metal Ladders and narrow ledges go up through a weaknesses in the steep crags which are just beyond the treeline, directly above Argentiere. This side of the valley is named the Aiguille Rouge and is also a Nature Reserve. It's best known residents are the ibex which you are very likely to see. It was 'rush hour' when I arrived at the foot of the steep ground. So I avoided the bottleneck and went looking for an ibex or two to photograph, success! 15 mins later and it was quiet up the Iron rung way. Stunning views across the valley. After the steep ground it's a lovely trail to the lakes. Lots of snow around, a great foreground again the big mountains across the valley. In my eyes the finest lakes are the Cheserys not Lac Blanc. 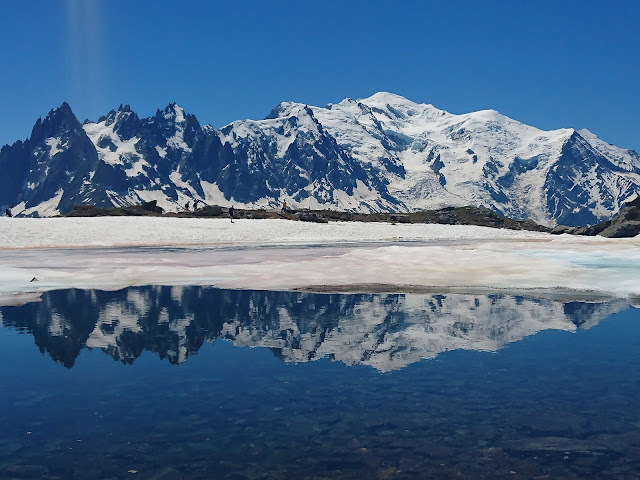 You get some cracking views from them and if you're lucky a Mont Blanc reflection. The final 100m or so up to Lac Blanc is in snow. Watch what's coming down from above, folk bum sliding with not much thought for people below! I survived the bodies hurling down around me and mingled with the masses up at Lac Blanc. Most folk who go to Lac Blanc head up from the top of the Flegere cablecar. It's always amusing watching folk still heading up late afternoon. Presumerbly they are hoping to catch the last car down. Do they all make it? One of life's mysteries! Another brilliant day.